Light isolated building system for housing, garages, extensions and internal walls. 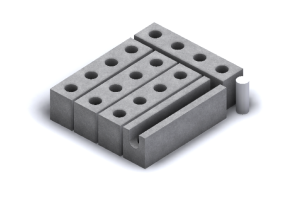 The SMARTBLOC System II consists of 2 components: standard blocks and U-blocks. Use of the locking plugs and reinforced concrete in pillars CC 400 mm and U-block, gives a strong light insulated construction. It is not applied adhesive or mortar, either vertically or horizontally. Innovative block of cooperative properties that can be calculated together with load bearing construction.